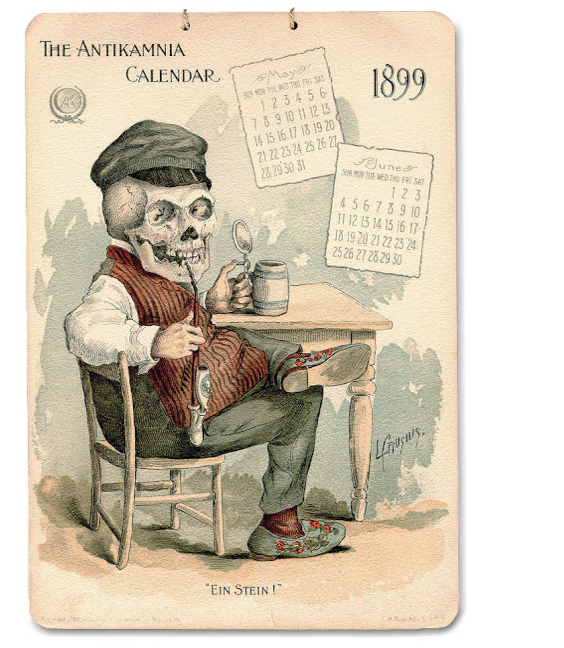 Dr. Louis Crusius (1862-1898) never got to see all of his artwork published in The Antikamnia Calendars. Nor did he live long enough to see the trend of Halloween trick-or-treaters at his door dressed as skeletons, ghosts and witches. He died an untimely death at the age of 35 during exploratory kidney surgery. 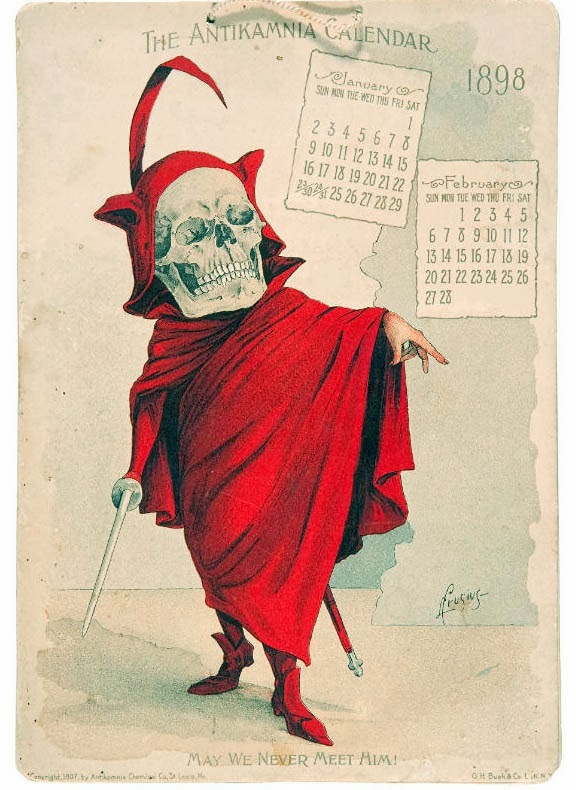 Colleagues at the Antikamnia Chemical Company, happened to purchase thirty of his illustrations shortly before his death and published them in a series of five promotional calendars beginning in 1897. 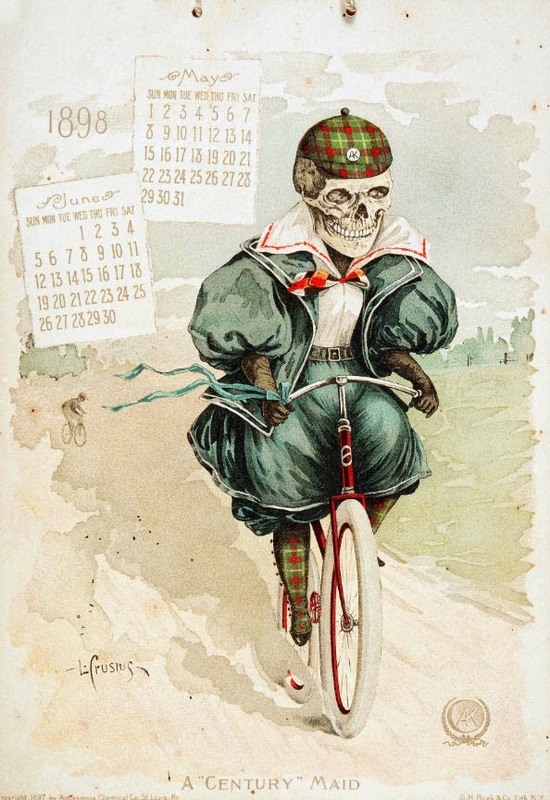 His watercolor "skeleton sketches" as he named them, were printed as chromolithographs in limited editions and published in French and English. 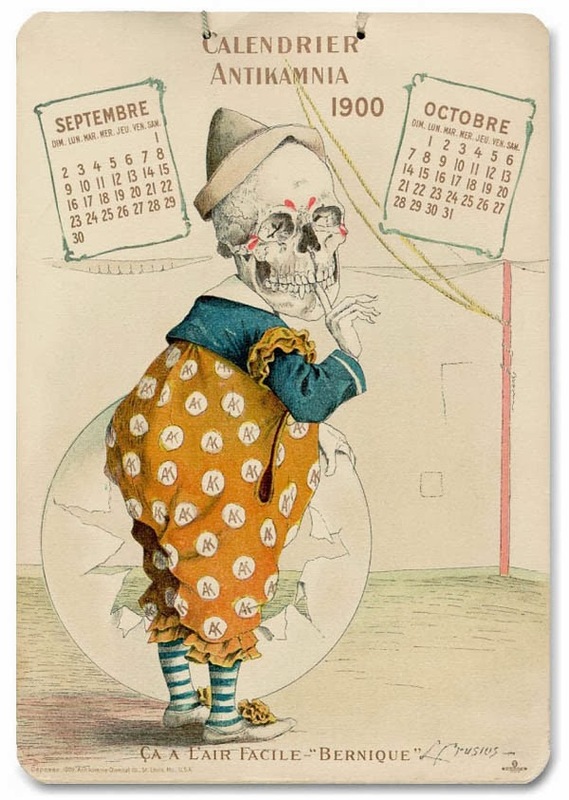 Complimentary copies of the 7x10 inch calendars were primarily sent to doctors in the US and overseas where they became widely popular. 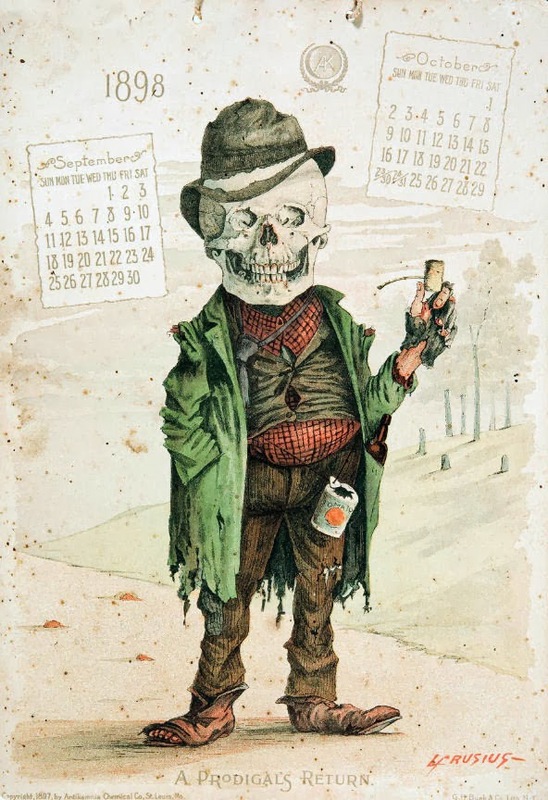 Based on the whimsical illustrations of Dr. Crusius, I suspect he was a very likable character. At the age of fifteen, he was a printer's apprentice for a small daily German newspaper published by his father in Wisconsin. He later went to work for an uncle in Texas who owned a drugstore, which started him on a path to become a pharmacist and later a physician. 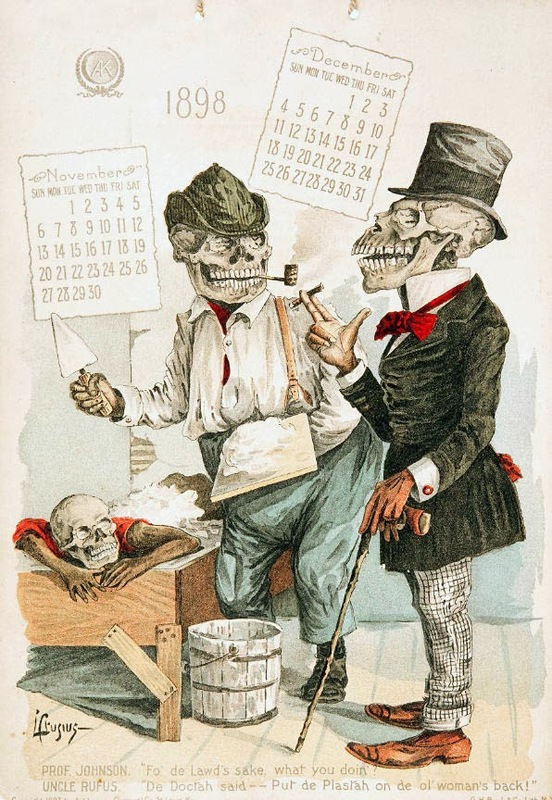 It was during his short career as a pharmacist he became such a prolific illustrator. 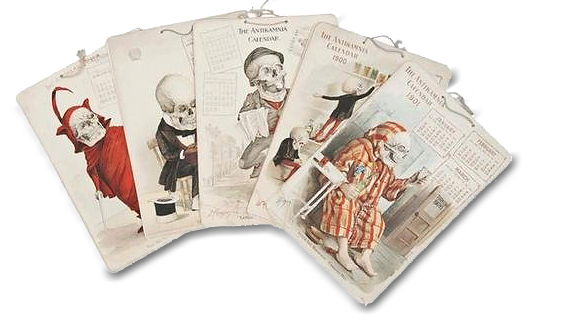 He would often display a series of his comic watercolor sketches in the shop windows at the drug store, only to give them away just as frequently. Newer creations would replace them each week. 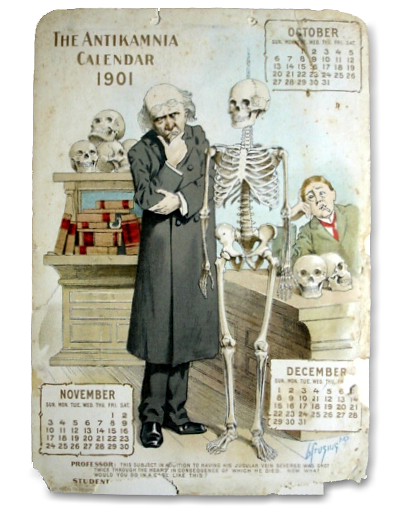 This 1898 calendar set sold at auction in 2011 for $556. Ouch! 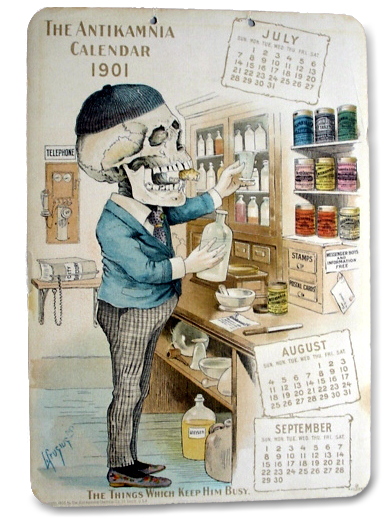 Louis Crusius, MD was a pharmacist, artist and professor in histology. Source: The UCLA Louise M. Darling Biomedical Library. Downloadable images available. 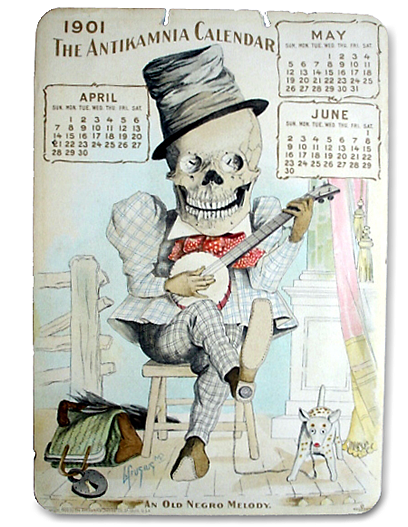 In total, there are thirty different "skeletal sketches" for all five calendars. The five calendar images above are from Modular | Four. I have yet to see all thirty images in one place. The four examples below were on eBay last year. 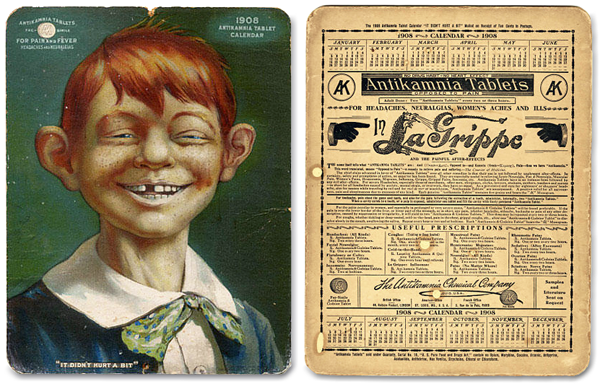 In 1914 The Antikamnia Chemical Company was prosecuted for libeling themselves and neglecting to disclose the active ingredients on their pain reliever packaging. According to the report from the NYC Bar Association, they had never patented their medicine, but claimed it was made from a coal-tar derivative. They also offered it was "mixed with codeine to enhance its pain relieving effects" for treating "Worry (nervousness blues)". In 1907 they were singled out in a published California state medical journal report for using the ingredient Acetphenetidin, which was recognized as a cause of birth defects and impaired fertility. They were found guilty seven years later. 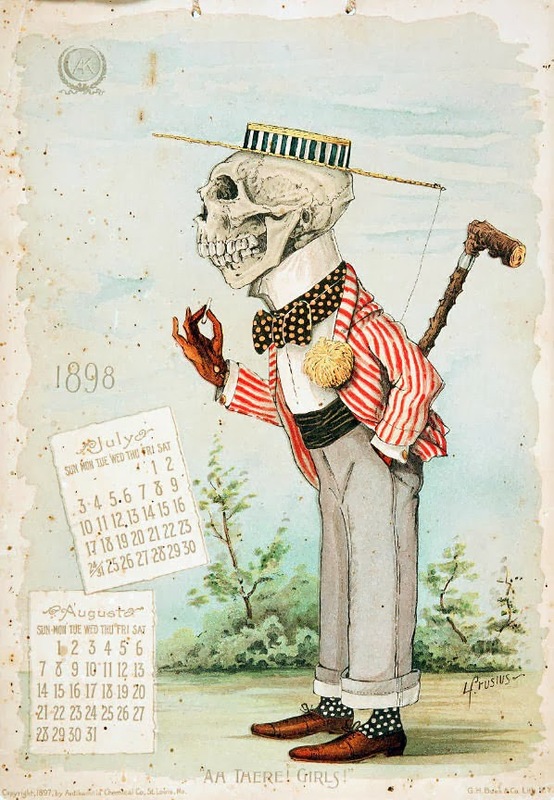 The macabre artwork of the Crusius' calendars now seems all the more ironic in view of this shameful indictment. 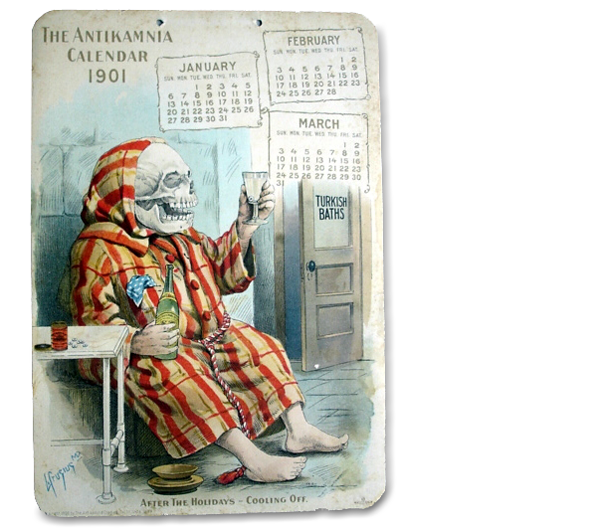 In the further interest of American marketing lore and evolution of branding—the 1908 Antikamnia calendar published just a year after the severe indictment, featured a grinning, toothless character who claims "It didn't hurt a bit". Maybe because he was in a near drug-induced coma? 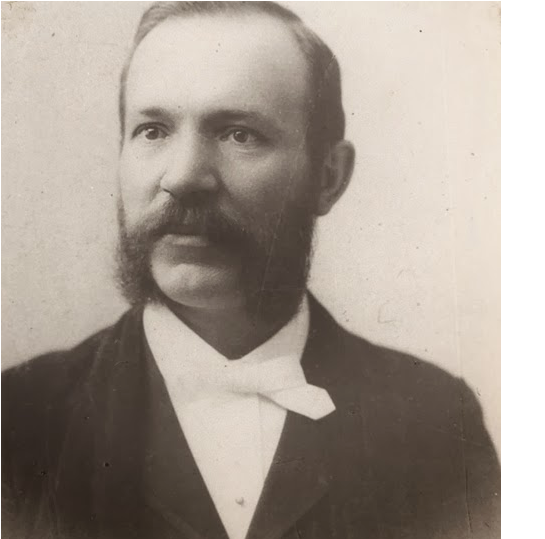 Not only was the early 19th century a time of miracle cures and false advertising, but it was also the era of Wild West branding and trademarking. 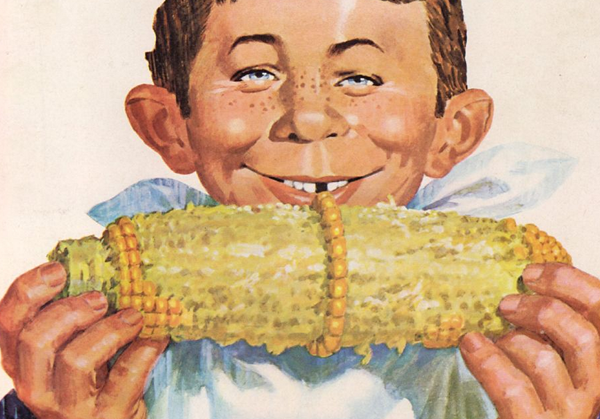 This same hapless calendar kid is also considered by many to be the origin of Alfred E. Neuman; the What-Me-Worry iconic hero of Mad Magazine fame. Considering the original source, it somehow seems like poetic justice to have Alfred E. laugh in the face of trademark infringement. What-you-wanna-sue-me?